Sizing Notes: This blouse runs larger than most costumes. 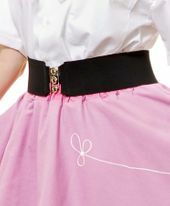 Complete your sock hop costume in this adult size blouse with an embroidered poodle patch with gold trim leash on the chest. 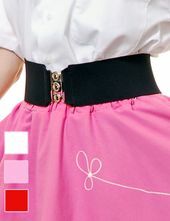 Button-front 50's style top has a peter pan collar and short sleeves. Comes in white with a pink poodle. Poodle skirt, belt, scarf and other accessories sold separately. Note: This blouse runs larger than most costumes, see size chart for detailed measurements. Check out our other 50's costumes and 50's accessories!